On arrival, visitors ride a shuttle from the 4,000-space parking lot along a 1 mile (1.6 km) path to the ark. Photo opportunities are provided as visitors approach the Ark from its "Port" side. (Contrary to the intuition of many, the end with the fin is considered the "bow", and what may resemble a modern bulbous bow is actually the stern of the structure.) 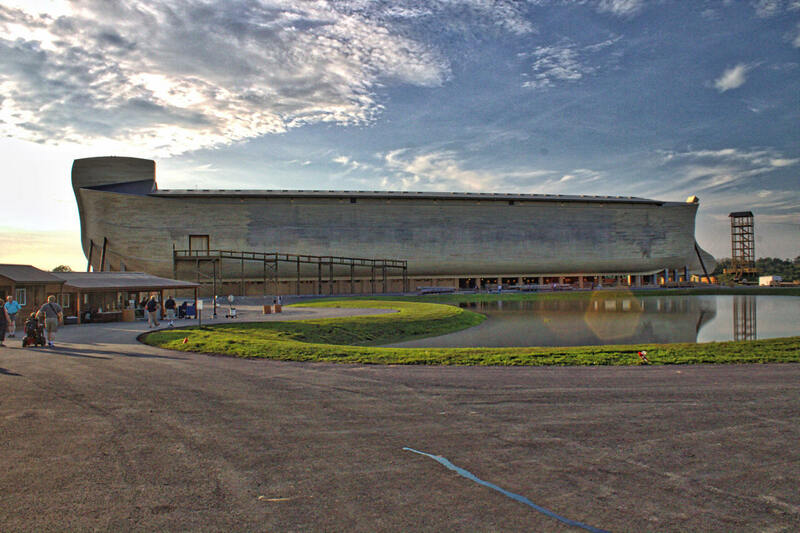 The ark contains 132 bays, each standing about 18 feet (5.5 m) high, arranged into three decks. Visitors enter on the lowest deck and move between decks on ramps constructed through the center of the ark. Bays on the first deck contain models of some animals that AiG believes were on the ark; there are no live animals within the ark. The models are meant to represent "kinds" of animals, which AiG maintains gave rise to modern animals through an assumed process of rapid speciation following the flood. Dinosaurs are among the models presented. The second deck contains more animal models, along with dioramas of Noah's workshop and a blacksmith. Bays on the third deck contains displays presenting AiG's theories about what may have happened inside and outside the ark during the flood. Displays in three of the bays display artifacts from the Green Collection and promote the Museum of the Bible, a Washington, D.C. attraction currently being constructed by the Green family, who donated to the Ark Encounter's construction. The ark is held 15 feet (4.6 m) off the ground by a series of concrete towers. The "starboard" side of the hull merges into three 80-foot (24 m) masonry towers containing stairwells, elevators, and restrooms. A gift shop is positioned below the ark, while a restaurant called Emzara's Kitchen – an allusion to the traditional Jewish name for Noah's wife – is located behind the ark. The Ararat Ridge Zoo, a free petting zoo, is also part of the attraction. Ark Encounter is a Christian fundamentalist theme park that opened in Grant County, Kentucky on July 7, 2016. The centerpiece of the park is a full-scale model of Noah's Ark from the Genesis flood narrative in the Bible which is 510 feet (155 m) long, 85 feet (26 m) wide, and 51 feet (16 m) high. 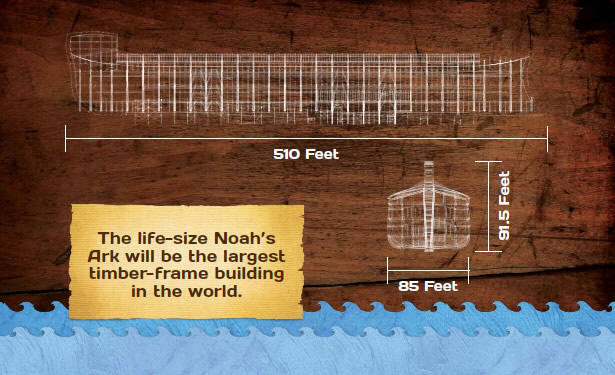 It is one of only three full-size Noah's Ark replicas and derivatives in the world, and the largest of the three. 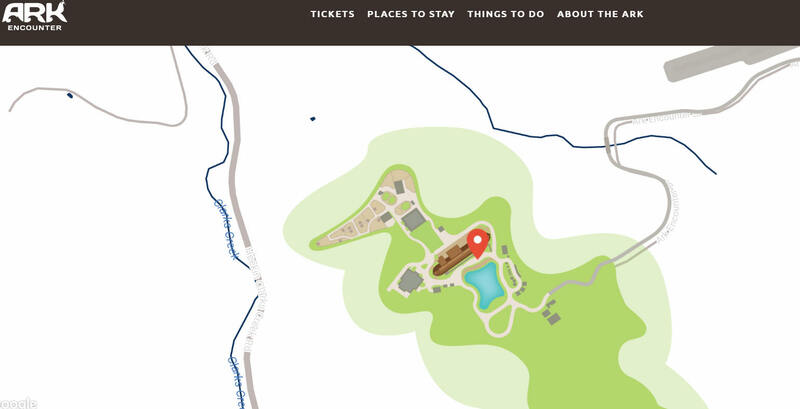 Ark Encounter is operated by Answers in Genesis (AiG), a Young Earth creationism group that operates the Creation Museum 45 miles (70 km) away in Petersburg, Kentucky.